The budget leaves $6.4 billion unspent, including $2.9 billion under the state’s constitutional spending cap, which limits the growth of some state funds. Lawmakers also left untouched another $11 billion in the state’s Rainy Day Fund, which is fed by oil and gas production taxes. The budget also includes funding to cover $3.8 billion in property tax relief and franchise tax cuts for Texas businesses. A 133-15 House vote was preceded by hours of occasionally heated debate in which both Democrats and Republicans took issue with certain levels of funding. The votes against the budget in the lower chamber included state Rep. Sylvester Turner, D-Houston, who served as Otto’s vice chairman on the Appropriations Committee and was the only House Democrat to serve on the conference committee that worked to hash out differences between the two chambers' budgets. Turner called the amount allocated for public education in the final budget “woefully inadequate” and also cited frustrations with spending levels for transportation and physician reimbursement payments for Medicaid. “I think when we look at this budget, there are some legitimate concerns, and I don’t think we’re particularly dealing with our priorities: education, infrastructure, health care,” Turner said. Several House Democrats also expressed frustration at $800 million going to border security funding, arguing that lawmakers were not including metrics to ensure that the money was being effectively used by state agencies, particularly the Department of Public Safety, which has faced questions about the extent of its role in apprehensions along the border. State Rep. Matt Schaefer, R-Tyler, defended both the level of border security funding and the extent to which DPS has reported on its effectiveness. State Rep. Helen Giddings, D-DeSoto, said she thought the budget was “lean” on public education funding when it left the House with $2.2 billion to spend beyond increases to cover enrollment growth. The final version of the budget hewed closer to the Senate proposal, with $1.5 billion above enrollment growth. Across the hall in the Senate, the tone was more civil during the upper chamber’s two-hour discussion on the budget. The budget eventually passed 30-1, with state Sen. Sylvia Garcia, D-Houston, the lone “no” vote. Nearly every other senator praised the work of Senate Finance Chairwoman Jane Nelson, R-Flower Mound, as the Senate’s lead budget writer. “This is a responsible budget, it is a compassionate budget, and it will keep our state strong and prosperous,” Nelson said. 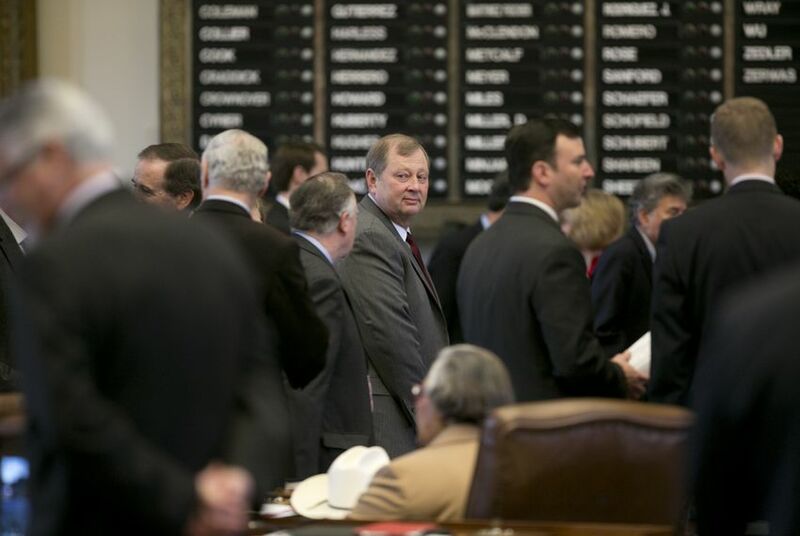 Though he voted to pass the budget, state Sen. Kevin Eltife, R-Tyler, was outspoken on what he thinks are the budget’s shortcomings, specifically as it relates to the Employees Retirement System (ERS). “Did we really do anything to cut the $7.5 billion unfunded liability in ERS?" Eltife asked. The budget increases the state's contribution to the pension system and puts it on the path to actuarial soundness, though some had argued for putting more in it given the state's healthy reserves this session. Eltife added that it was disingenuous for lawmakers to gavel out, go home and “thump their chests,” and only note the successes of the session.